Chris: First of all, I am a big fan of not only Anchor craft beers, but the philosophy and care behind the brewing process. I have toured the brewery a few times and was blown away by the small size and also that the beers are still essentially made by hand, not a machine. Keep up the good work! My question is: Do you alter the recipe for Steam Beer occasionally? I feel as though Anchor Steam doesn’t taste the same as it did, say 8 or 10 years ago. It is certainly possible that my palate has changed. I have also tried many other beers since then, and become a much more experienced and evolved beer drinker too. Not that it really matters, because I still enjoy it. Just curious. Thanks! Bob: Chris, we have not changed our recipe. What has happened over the last ten years is that the use of hops in craft beer has exploded. 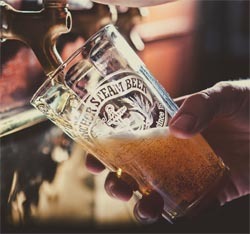 Anchor Steam used to be considered to be one of the most highly hopped beers around, but is at the lower end of the spectrum compared to a lot of others today. If you have been experiencing today’s craft beers, especially those in the IPA category, you may have become accustomed to more robust hop rates. That, and the fact that there are many styles now available that have a higher ABV (alcohol by volume) to go along with these robust hop rates. Anchor Steam is the same beer that you enjoyed years ago and will remain so. Treat yourself to pint on tap somewhere and let yourself remember when… Stop by the brewery if you’re in San Francisco and the pint is on me. Thanks for the compliment. And I, for one, am very glad that the recipe has not changed. Bob’s got it right: our beer-drinking palates have been bombarded with all these muscular brews on offer. It takes a subtle, skilled hand to make a beer like Steam. All of Anchor’s offerings, in fact, display the same qualities. The Bock beer, in particular, and Brekle’s Brown, although quite flavorful, lend themselves to drinkability even considering their robust profile.